Addressing more than 300 Jain community members of Chicago area during the Federation of Jain Association in North America (JAINA) meets the Jain Society of Metropolitan Chicago (JSMC) event. JAINA convention leaders and board members visited JSMC to promote upcoming JAINA Convention 2019 (July 4-7) at Ontario, California. Convener of JAINA Convention 2019 and First Vice President of JAINA, Mr. Mahesh Wadher of Southern California, proudly explained the theme “Celebrating Jain Religion in 21st Century” and conveyed that attendees will have everlasting impression of JAINA and a unique immersion into Self-Realization with Education, Entertainment and Inspiration. Mr. Wadher laid out his vision of sole focus on volunteerism with an eye on comfort and convenience of the attendees that would set a new benchmark for future conventions. Convention Co-convener, Dr. Nitin Shah of Los Angeles, mentioned that the planning for the JAINA 2019 Ontario convention started over a year ago with the creation of various committees and their leads. In October 2018, when 200+ volunteers met face-to-face for the first time at Ontario Convention Center, all were pleasantly inspired with the energy and enthusiasm in the room and everybody’s willingness to help make this the best JAINA convention for the attendees. JSMC Chairman Board of Trustees and JAINA convention Board member, Mr. Atul Shah told JSMC members that Chicago community has one of the highest registrations in this convention next to CA registrations. Mr. Dipak Doshi & Mr. Hemant Shah of Chicago, both past Chairman of JSMC and also Committee Chairs of JAINA and Public Relations and Media; announced Convention’s distinguished Keynote Speakers and shared how keeping the Jain Philosophy of Ahimsa, Anekantvad & Aparigrah in the forefront, Programming Committee has assembled world renowned speakers who would inspire through their insightful speeches on the topics of Seva, Satsang, Samarpan, Sadhana, Self-Realization, Current World Challenges, and many other topics. Among Keynote Speakers; Sadhguru Jaggi Vasudev – Yogi, mystic and author involved in social outreach and environmental initiatives; Tulsi Gabbard – First Hindu US Representative from the State of Hawaii; Ingrid Newkirk – President of “People for the Ethical Treatment of Animals” (PETA); Philip Wollen – Animal right activist; ISKCON Monk Gaur Gopal Das – a Motivational Speaker, Life Coach and Engineer and Nipun Mehta – Founder of Servicespace.org, a volunteer based non-profit. There are 80+ distinguished speakers including Jain Sadhu-Sadhvis, Professors, Doctors, Scientists, Authors, Swadhyaykars, Jain Scholars and Spiritual Guides; such as: Acharya Shri Chandanaji – Founder of Veerayatan and First Jain Sadhvi to receive the title of Acharya; Acharya Dr. Lokesh Muni – Social reformer, thinker, writer, poet; Acharya Namra Muniji (via live video conference) – A revolutionary saint with extraordinary dynamism; Gurudev Shri Rakeshbhai Jhaveri – Spiritual Leader and Founder of Shrimad Rajchandra Mission, Dharampur, India; Saman Shrutpragyaji – One of the most articulate and charismatic young spiritual leaders of the new generation! First time attendees can expect to see the largest gathering of Jains in North America and partake in networking opportunities, over 5,000 Square feet of Jain Temple to be created at Ontario convention center for daily prayers of 24 Tirthankars, concurrent talks on various topics including – Religion, Jain way of life, Ecology, Cruelty Free Products, and Exhibit Space with over 50+ vendors. One of the significant youth education and development initiative is a team-based competition, Jain Academic Bowl (JAB), launched first about a decade ago. JAB is a jeopardy style vocabulary game in which young Jains compete with other teams. Topics range from Jain religion, scriptures, prayers, and philosophy to Jain geography, history, and a Jain Way of Life in the modern world. JSMC President and Convention Committee “Jains Got Talent” (JGT) Chair, Mr. Vipul Shah, mentioned that, as the sun comes down, the entertainment will amaze you! Each night will be a night of excitement with music and dance till wee hours of the night. On Thursday night, Parth Doshi, Kalpesh Kharwa and Shilpi Paul will lead into the traditional Raas-Garba with their melodious singing. The Cultural Program “One World, One Rhythm”, will rock with in a non-stop music, dance, and drama performances by artists of all ages on Friday night. The JGT competition participants will showcase some of their enactments on Saturday night followed by an enthralling “Bollywood Night” show conducted by Rex D’souza, Mauli Dave and Sunny Jadhav. JSMC General Secretary and Convention “Jain Connect” Chair, Mr. Piyush Gandhi, introduced Jain Connect as a new perspective on how to make, build, and retain genuine connections in the real world for Jain youths age 21 to 42. Whether you’re looking to make new friends, new business connections, or find a special someone, Jain Connect will be using variety of tools to get to know you better and help you meet other convention attendees. Special sessions will be held specifically for Jain Connect registrants focused on communication, relationships and marriage in the 21st century. If you plan on attending these events, then please register for both JAINA and Jain Connect. JSMC Board of Trustees and Convention food committee Chair, Mr. Hitesh Shah, mentioned that, this time all the meals are going to be served by BAPS of California. 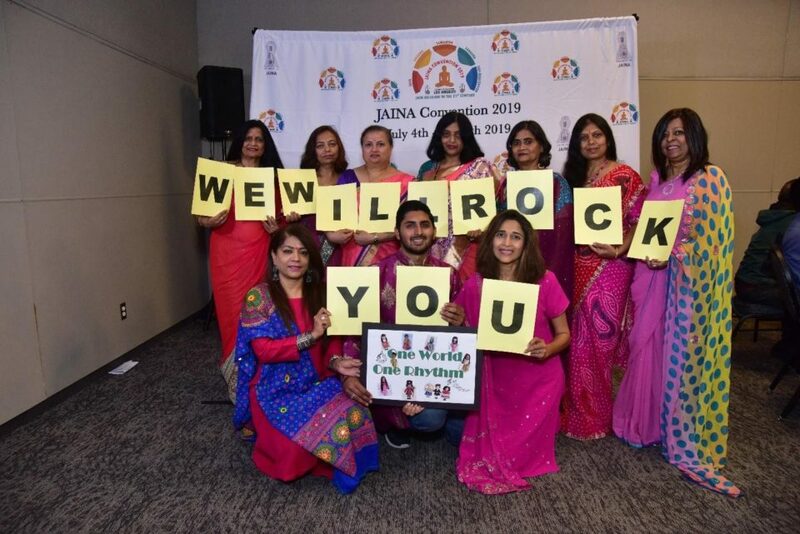 He also added that, the JAINA Convention volunteers are working very hard to make sure all the attendees from various parts of the world will get something out of the 4 days of spiritual and cultural programs. Being featured for the first time in JAINA convention history and hence unique to this convention are; Shatavdhan – Jaynesh Jain will demonstrate his ability and talent to memorize 100 questions, objects, or statements asked by a live audience. He will recall these questions, and even answer them as per his ability, in any order or sequence. Art Workshop – Kartik Trivedi, the famous artist whose impressionist paintings are hanging in world famous galleries and accepted by Late President Ronald Regan, President Bill Clinton and French President Francoise Mitterand, offer a hands-on 3-hour art workshop. Jain Yoga – Shanti Parakh, an internationally known Yoga teacher, Reflexologist, Metaphysician and Healer, will conduct morning Yoga sessions on July 5th and 6th. He has created a series of Aasanas based on the Lanchhans of the 24 Tirthankars such as Halasana for bull – the lanchhan of Rishabhdev; Gajasana for Elephant – the lanchhan of Ajitnath, etc. While in Southern California, attendees can get the most out of their trip by extending their stay and taking one of the many tours available. i.e. Disneyland Tour, Universal Studios and Los Angeles City Tour, Las Vegas and Grand Canyon 3 days or Day Tour of San Diego City and Sea World. To get the benefit of early bird pricing, Register now at www.jainaconvention.org. For Further Information, please contact: Mr. Dipak Doshi, Chair of Public Relations and Media Committee of 2019 JAINA Convention at dipakginni@gmail.com or Co-Chairs, Mr. Hemant Shah at hemantil@yahoo.com or Dr. Manoj Jain at mjainmd1@gmail.com.